The essence of any modern art form is within the presentation of clarity and full disclosure of the form itself. To be modern is to be a materialist and for the practice of painting this means the arrangement of a skin of paint on the surface of an object. The form is within the parameters of the surface; the reason for the paint medium is to cover the surface with pigment; and the function of pigment is to divide light. So all painting, in one form or another, is a membrane of divided light within the objectness of its form. In the architecture of painting, function follows light. To understand the modern art of painting, it is necessary to recognize that it is not the fact of the material that makes a painting, what determines the art of painting is the painted quality of the color within the gestalt of its objectness. Peter Tollens is a modern painter who mostly works with an oil paint in a pasty consistency applied with a firm brush to a determined flat surface. The relationship between the paint medium and the tool of application leaves vertical marks etched into the paint surface. The effect of these marks is the presentation of an activated frontal surface that gives the viewer a visually intimate relationship to the painting. Two things are important to the understanding of the marks within his paintings. First is the recognition that the specific performance of making the marks on a surface is fundamentally related to a drawing function. The nature of marking is conducive to gestural self-expression and is either derived from, or an extension of, writing as touching. 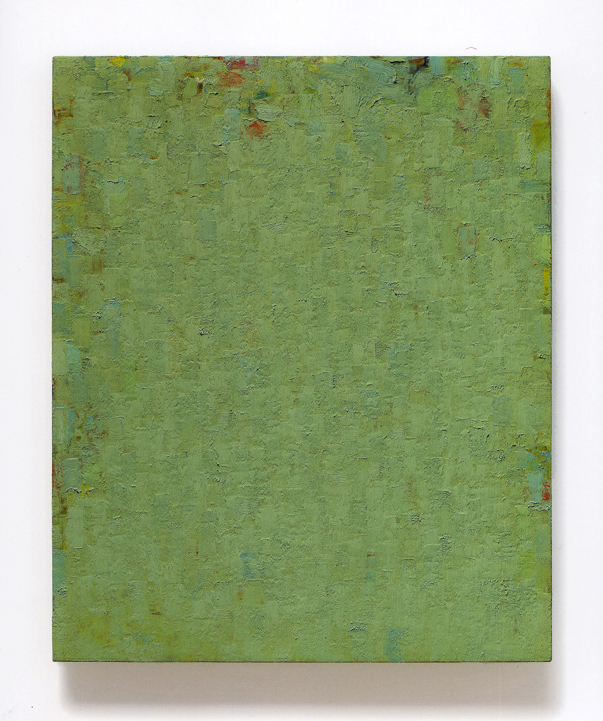 And secondly, the paintings of Peter Tollens present us with a paradox when we realize he is making a color statement. This immediately raises the important distinction between painting the color and drawing with paint. To understand this distinction, think about this for a moment. When you sign your name with a fountain pen, does the unique gesture of your signature depend on the color of the ink? How would you sign the color, or, what gesture is blue? To understand this in terms of contemporary art, ask yourself this, what is the color identity of a work by Cy Twombly, or the drawing in a painting by Mark Rothko? Twombly’s work is dependent on the gestural expression of his drawing with paint. It involves narrative story telling about something outside of the painting itself. It is marking as an expression of writing. Rothko presents a relatively smooth surface inflected mainly by different colors. He presents an image as painted color that depends on our feeling response to the presentation of the color. 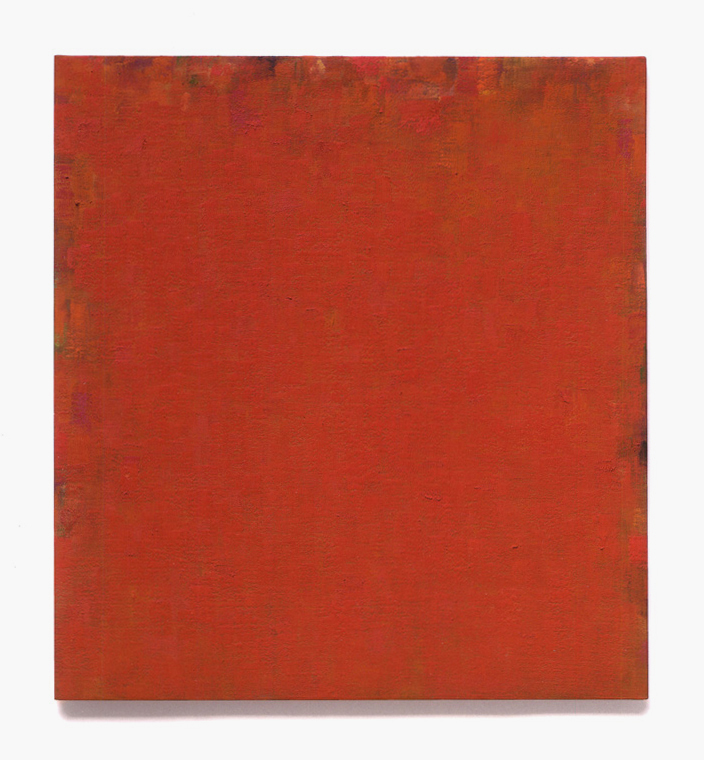 Peter Tollens, like Rothko, presents us with paintings that are clearly color statements. 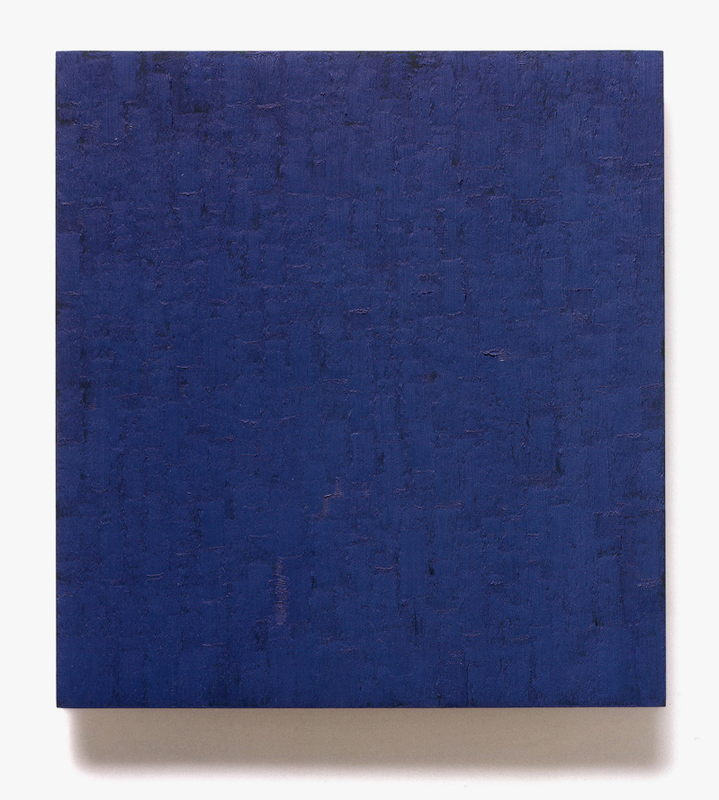 But, unlike Rothko, Tollens’ paintings are covered with a texture of well-ordered brush marks of paint. They are highly articulated, frontal surfaces of applied paint that provide us with a visual gestalt for the experience of color. The question that we are pursuing here is – how do the brush marks in the paintings of Peter Tollens function in the painted quality of the color? When you have wet paint on a brush in hand, there are two immediate and obvious impulses of its use. First is the child like impulse to smear the paint across the surface in some linier gesture that reveals personality traits of the maker. Do you cross your t’s, dot your i’s; Cy Twombly is right handed. 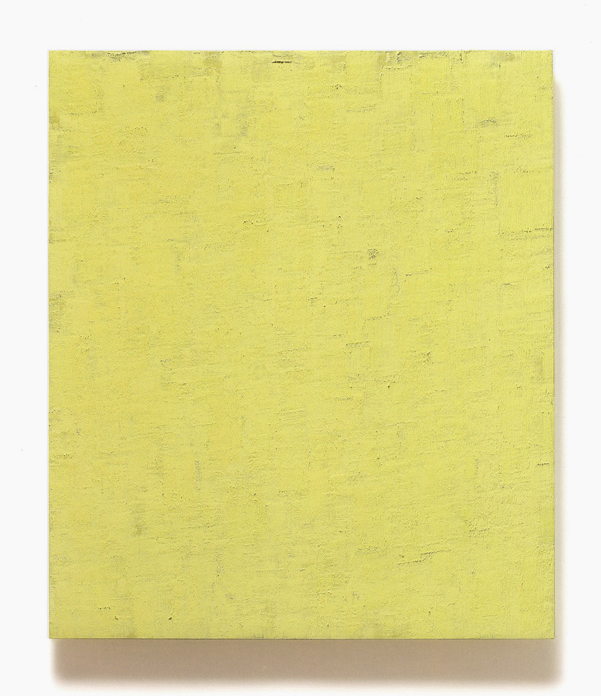 Secondly is the more restrained impulse to touch the surface leaving an imprint of a mark, and then to repeat the mark accumulating a rhythm or a visual mantra such as we se in some of the works of Robert Ryman. The “mark” locates the material boundary of the thing itself, i.e., its objecthood. With both of these impulses we recognize the artist applying paint to a surface. The marks stand as an embodied record of their making. But what color is the impulse “to mark”? We would have to begin to question a corresponding relationship between the expression of the mark and our feeling response to a color; that is, between the signature and the color of the ink. There is a reason Twombly and Ryman are not making color statements. Their work is about the specific performance of the mark itself. Their art form is drawing and they have both contributed significantly in the late 20th Century to the establishment of drawing as an independent art form in and of itself. The brush marks of Peter Tollens are not like the personal signature of Cy Twombly, nor are they the repetitive marks of a mantra exercise that transcends the specific moment of touching. Tollens is not drawing with paint, he is painting the color and without understanding this distinction you cannot recognize modern painting today. The mastery of any art, lies in the disciplined practice of its unique form. The recognition of modern painting requires that you do not see the paint medium as an extension of the bodily fluids of the painter, that is the function of drawing, for painting, the medium is a vehicle to carry pigment and the function of the pigment is to divide light. Our realization here lies within the understanding of how the pigment functions in the paint medium and how the brush marks function to illuminate its color. The visual experience that we call color is not the paint medium; it comes from the relationship between the pigment in the medium and the light on the medium. The pigment engages the light waves and divides them according to its chemical compound; absorbing some waves and reflecting back others. Pigment divides light. Color is the means by which we see the light. We identify that light as a certain color such as yellow or blue within a full spectrum of light waves. Lights of different frequency possess different hues. We designate the variety of colors by their light value and emotional temperature. Seeing the color shift in the light spectrum is the recognition of the movement of the light itself; (as opposed to the placement and moving of the light source). In the natural light of the day, all paintings are moving images because the Sun changes its visual temperature in the atmosphere of the rotating Earth. So the color of the painting shifts its position in the light spectrum. The Sun is the source of its being alive. It is the mover of the body paint. When attempting to achieve a fully realized modern painting, the intent is not just to move the paint around on a canvas to draw out the personal narrative of the artist. The uniquely optical art of painting is not an extension of, nor derived from touching precisely because color is a property of light and where is the boundary of light to touch. The real practice of painting is in the movement of its light, that is, in the division and full breath of its color/light presentation. Within the practice of the visual arts the relationship of light to a body form has three conditions. One is the light shining directly on a form that reveals the direction of the light source and shows the volume of the object. It is the value scale, (chiaroscuro) light and shade of sculptural form; second is the light across the form that locates the surface by visually activating its texture. This is the temperature-less (grisaille) light of drawing; and third is the division of light itself that reveals its internal color. This is the disembodied light of painting. It requires the precondition of a frontal flat surface to see the movement of the light itself, i.e., its color shift. To understand how brush marks function in Peter Tollens paintings first begin by trying to imagine a black and white photo of a traditional easel picture painting such as the Mona Lisa. What that image will give you is all the sculptural volume of the forms within the composition, without the emotional impression of the color or the true luminosity of the painting. Then imagine a black and white photo of a painting by Vincent van Gogh. With that image you will see all the drawing elements of his composition without any sculptural volume of forms. If you then reverse the exercise and try to imagine just the color of a van Gogh painting, without the drawn image, it is much more difficult. The difficulty is in the fact that van Gogh’s color is intimately linked to the expression of the depicted image by the dynamic force of its placement and the intensity of its emotional expression; van Gogh is drawing the color. It is there, not only as his expression of an external subject; it is the color itself as the emotional subject. The paintings of Vincent van Gogh present an emotionally brilliant statement of color. There is a clarity of the individual pieces of paint that seem to fit together like a jigsaw puzzle. His compositions seem to have a virtuosity of performance with no hesitation or erasure in the placement of the marks. The expressive identity of his color is identical with the performance of his brush marks, so you cannot easily separate the color from the composition of the picture because his color is not a secondary condition of the image. It is not just an applied drapery of color laid over a sculptured form. His color is equal to the expression of the mark; van Gogh does not render volume, he draws color. 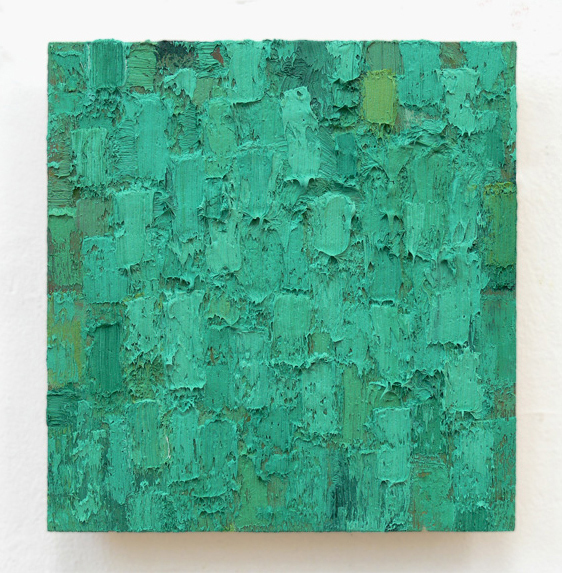 As concrete objects, his paintings have an intensity of color and a directness of the mark that presents us with the specific performance of a textured surface of color. The paintings of Peter Tollens, like those of van Gogh, also present us with an emotional gestalt of expressive, dynamic color as a textured surface. Both have paint surfaces filled with individual brush marks that correspond to the expressive identity of the painting. But Tollens’ painting, unlike van Gogh, first of all, is a textured surface of vertical marks that correspond to the form they are applied to; that is, a frontal flat rectangle in which the brush marks give internal scale to the painting as an actualized object; and secondly, his marks do not have the character of gestures of personal expression. They are neither embodied marks on a surface nor are they arbitrary marks into a wet paint surface. Their dominant characteristic is the texture of the color. Tollens’ painting presents the integrity and autonomy of the materials within the art form, and it is clearly evident that color is the subject of his paintings. But our concern here is not the particular nature of his color statement as art; that is, not the psychological gestalt of certain colors, nor the archetype of a color statement in relationship to the concrete presentation of a painting form. Our inquiry here is specifically about the function of the brush marks in the form. The difficulty in piecing this out lies in the fact that the brush marks in Peter Tollens’ paintings have somewhat the characteristic of not being on the surface. The paint field is not made up of individual pieces of paint we can lift off the canvas, but rather they appear to be integrated in , and as, the surface of the paint. The paint is on the surface of the object ‘painting’, but the tool marks of the brush are of the paint medium. Because of this, they do not have the status of an embodied piece of paint, a characteristic so evident in some of the works of van Gogh. With van Gogh the color is equal to each individual brushed piece of paint. Each mark seemingly to stand-alone as a piece of color. With Tollens it is not so mush that we are aware of the color of the paint medium, as it is that we are aware of the color of the painting. Tollens seems to be laying open the medium and it has the sense of reveling color from within. But the marks do not have the feeling of cutting away or tearing open the surface to see what is behind the paint, nor is he just marking up the wet paint to give the surface a texture. It is rather a laying down and building a paint skin in which each application is embedded in and interlocked with the previous marks. The brush marks do not stand alone as individual expressive gestures of the artist, they are subsumed into the surface of the paint and function as part of a multi-faceted skin to capture and divide light. They lay open the medium to facilitate the presentation of the color. To facet the paint medium in this context does not mean to polish an angle revealing the brilliance from within, it is rather to create a surface of many angles to capture the light from different directions. 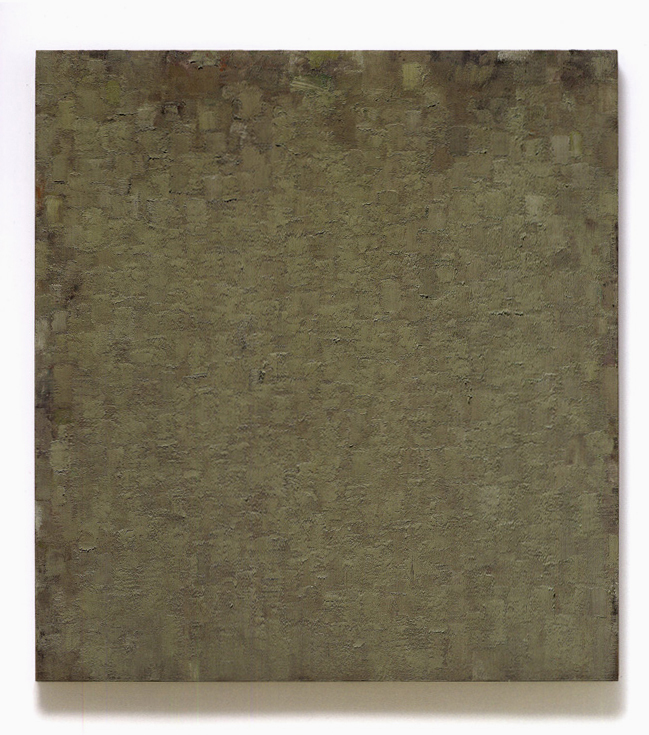 The multifaceted texture of his painting lays open the paint medium so the pigment within is fully exposed to the light, this raises questions about the relationship between the visual character of the pigment (the intensity of its color) and the nature of the paint medium (the density of oil). The refractive indices of the graduals of pigment are related to the particle size of the pigment, and the optimal particle size is related to the specificity of the color you want to see. There is a direct relationship between the pigment size and the density of the medium in regards to the clarity of the color. For example, a pigment that we identify with the term ‘emerald green’ achieves its maximum greenness in course particles size (the finer it is ground, the more its light moves towards white), add to that the density of the medium which diminishes the light, (only mediums that allow the pigment to lie up on the surface give the truest color of the pigment). This raises the question as to whether certain mediums and techniques are more conducive to the presentation of certain colors. It goes to the future question of the painted quality of the color. For modern painting the issue becomes – if you paint red in the same manner as you paint blue, are you drawing a picture or painting the color? It is in part, why we think certain painters have a color temperament. When all the elements are in harmony, the art reveals its clearest vision. How Tollens’ paintings physically manifest themselves can easily be recognized by visiting the painter’s studio and investigating his materials directly; the firmness of the brushes, the pasty-ness of the paint, the resistance of the painted surface, each contribute to the character of the mark. But you must understand here, it is not the fact of the materials that distinguishes a painting, it is the manner in which he engages the material – its painted quality, that informs the art at its highest and most intimate level. With van Gogh the brush leaves an embodied piece of paint that represents something outside of itself. With Tollens the brush simultaneously conceals and reveals the concrete actuality of the painting as the applied paint covers the surface of the canvas and the brush etches into and opens up the paint medium. It is a single act of application that cannot be separated into distinct components. Each individual brush stroke in Tollens’ painting, like those of van Gogh, places paint on the canvas and marks its location. With van Gogh the accumulated marks seem to lie on the surface of the canvas. That surface is a passive receptacle for the embodied pieces of paint. With Tollens the individual character of his mark is subsumed into the surface. In the process of completing a painting hundred of these marks are laid down in a general overall accumulated surface of vertical texture. That texture locates for the eye the placement of a frontal flat rectangle before the viewer. They are conspicuously concrete and yet clearly and fully optical, so there is no desire to reach out and touch the object to find its exact position in front of you, nor to repeat the gesture of marking. They are not signature marks of the hand that stand alone to identify the signature. There is a kind of objective distancing, — a measured proportion to the placement and distribution of the marks that allows you to grasp the whole painting as the full breadth of its color. 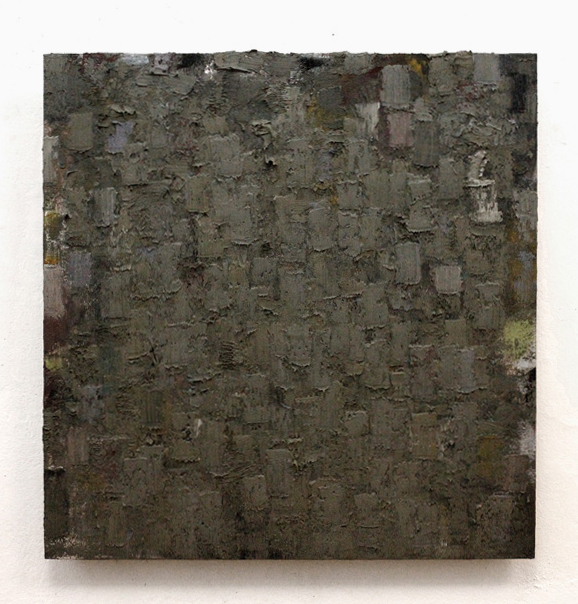 It is an active relationship of surface, mark and medium that gives scale and proportion to the painting. It is with Peter a certain rightness of the thing itself. The brush marks in Peter Tollens’ painting engage the body paint in the dance of its performance. The skin of paint becomes an active partner in marking so you cannot lift the individual pieces of paint from the surface; that is, separate the dancer from the dance, because the paint medium disembodies the mark in the act of its doing. Each element in building the body paint constructs an interdependent relationship of medium, mark, and color. His brush marks facet the medium to facilitate light. He is not drawing a picture of color; he is structuring the light within the objectness of the painting. It is the fashion of our contemporary art world to seek out concepts of art. The new academy sees the art object merely as evidence of a circumstance. The modern painter sees the art-work as an object at a location and investigates the logic of vision within the parameters of its form. We seek the integrity and autonomy of the thing itself. The great paradox of our modernity is in the idea that we can materially understand our world as the essence of being. We define modern art in terms of its unique materials and construct, and yet, when we have stripped away all the worldly decor of the day and are presented with clarity and full disclosure the thing itself, what we see emanating from that living membrane is dematerialized light. The material reveals the immaterial and the paradox is in our expectation of something other. The defining issue of our modernity is a question of boundaries. What are the borders of our material world and the boundaries of our human behavior? Within the disciplined practice of painting’s unique form we are confronted with the paradox of our expectations. The material art of painting divides light. The question for modern painting in our new global world is, – what is the function of its particular light in our collective consciousness. How do we recognize its value in our contemporary lives and understand its metaphor. Peter Tollens is one of the great modern painters of our day. He works within the practice of its form and celebrates the color of its light. The art of painting, when practiced at his level, illuminates the human spirit.